Red Bull Racing’s Daniel “Honey Badger” Ricciardo is one of the most lovable goofballs in motor racing. 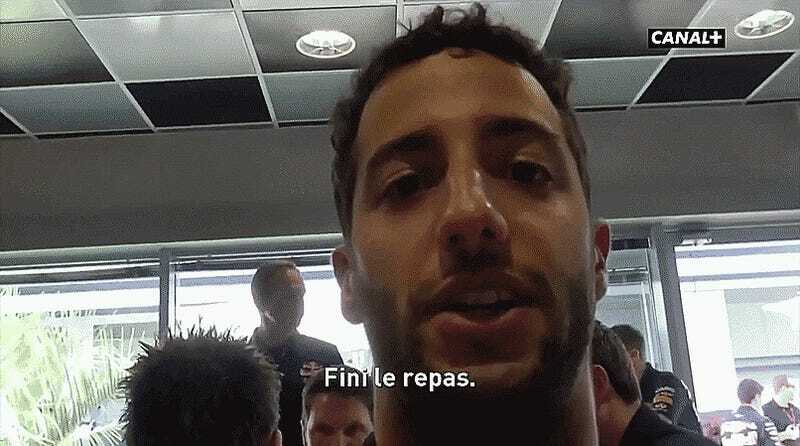 Here’s a behind-the-scenes look he gave French broadcasters Canal+ into the Formula One paddock at the Russian Grand Prix wherein he messes with anyone and everyone he can, because he can. I have to admit — drivers Daniel Ricciardo and Daniil Kvyat are the two biggest reasons I feel so bad for Red Bull’s power unit woes this season and the giant question mark hovering over the team’s participation for next season. Ricciardo should keep his day job, if for no other reason than he probably won’t have much luck in the world of music. Either way, enjoy this clever look into the immense preparation that goes into a Formula One weekend. Marvel at the stacks of spare underwear, lest a driver feel less than fresh, ahem, down there. Gaze upon the stuffed mascots that keep Daniel company in his private quarters. Check out the incredible carbon fiber bum-mold that F1 cars call a seat. Chuckle at the inability to translate “booty” into French, hence a subtitle about Shakira running in its place. Most of all, this is a great look into the heavily guarded small village that sets up to support a Formula One weekend. Happy viewing.